Cal Lutheran was one of eight colleges chosen for a Distinguished Performance and Production Ensembles Award from the pool of more than 50 invited to perform plays at eight regional festivals in January and February. (THOUSAND OAKS, Calif. – March. 26, 2019) The Kennedy Center American College Theatre Festival awarded California Lutheran University’s “columbinus” a Distinguished Performance and Production Ensembles Award and a Citizen Artist Award. This is the first time a Cal Lutheran production has won national awards. Cal Lutheran was one of eight colleges chosen for an Ensembles Award from the pool of more than 50 invited to perform plays at eight regional festivals in January and February. It was one of 10 colleges that received the Citizen Artist Awards for insisting that theatrical production is central to urgent community, national and international conversations on the campuses of higher education. 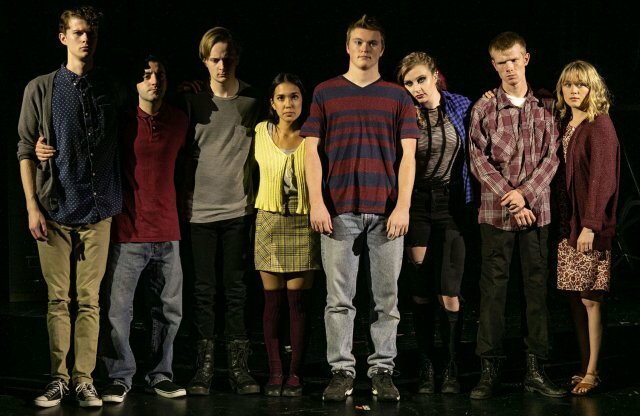 The play about the 1999 Columbine High School massacre had been set to open on Cal Lutheran’s Thousand Oaks campus the day after a shooter at the Borderline Bar & Grill killed 12 people, including 2018 alumnus Justin Meek, and sent about 30 of the university’s students fleeing. The original performances were canceled as the university community dealt with the shooting and wildfires that broke out hours later. Instead, 160 people attended a single invitation-only performance. Before the cast and crew staged “columbinus” at the Region VIII Kennedy Center American College Theater Festival in Los Angeles in February, they got a chance to present two public performances on campus. The 2005 drama examines adolescent archetypes and weaves together evidence, the shooters’ journals, and interviews with parents, survivors and community leaders. In preparation for the production, the Cal Lutheran students watched documentaries on the tragedy, researched the shooters’ mental health problems and learned how the shooting changed high school culture. The intensity of the play, which features hate speech and graphic descriptions of violence, was difficult for them, but they felt the message was important. That feeling increased after Borderline. Counselors met with the cast and crew, many of whom knew Meek and survivors and some of whom evacuated or helped others during the fires. Director Brett Elliott, cast members and Cal Lutheran psychology and religion faculty participated in informal discussions with the audience after each campus show. Other cast members are Clayton Currie of Ventura; Jonathan Irwin of Tacoma, Washington; Victoria Karr of Corona; Amber Marroquin of Costa Mesa; Jacob White of Palmdale; and Jordan Erickson and Mahyar Mirzazadeh of Thousand Oaks.